2 Hi, we now have two of these, an earlier post had a photo that was way too dark. This wild bird was brought to us for care. 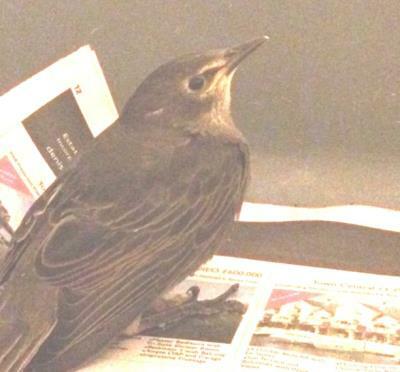 It was caught by a cat in suburban Dorset. It's about the size and shape of a nuthatch but the shape could be distorted by its pose under stress. It is brown all over except for black and yellow around the eyes. It's slightly larger than a robin but way smaller than a starling or blackbird. Its tail feathers seem to be intact and they're short, certainly shorter than a robin. We don't recognise it and can't find anything matching on the usual ID sites. Any help gratefully received.